An incredible Art Bowie by Van Barnett. This beautiful piece has an amazing fossilized walrus handle with brown and tan coloring. It is very nicely carved and fills your hand as this is a large knife. The D-guard has been blued and is connected underneath the pommel. The whole d-guard, pommel and guard has been wrapped with thick 14 karat gold leaves and an escutcheon with Van's name and one with a 14 K marking. 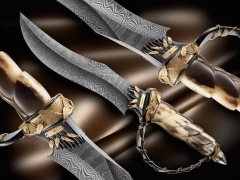 The blade is damascus steel by Van. An Outstanding Art Knife!